A Happier, More Relaxed Life!" Stress Is The Number One Cause of Many Medical Problems In The World Today. Anxiety Just Adds To Those Problems. But You Don’t Have To Suffer Anymore! We Have The Answers You’re Looking For! Many people deal with anxiety disorders that are aggravated and brought on by excessive stress. This illness can be debilitating, leaving you ill-equipped to deal with even the smallest problem. But that can be stopped by knowing how to manage stress and anxiety effectively and quickly. It can be an ongoing struggle, but the first step is learning how to cope with stressful situations that can bring on the anxiety. You may have had to spend a lot of money on doctors and therapists to get the tools that would enable you to live a fulfilling life. The good news is that if you are suffering from anxiety and excessive stress, you won’t have to spend the time and money just to deal with daily stress. You can get all the information you need – right here in this amazing book, “Eliminating Stress and Anxiety From Your Life”! 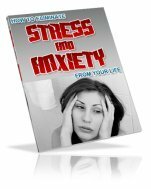 When you order this book, “Eliminating Stress and Anxiety from Your Life”, you will get a combination of expert advice from psychologists, educators, and people who suffer from excessive stress and anxiety. There are all kinds of self-help books out there that can help you deal with stress and anxiety. But most of them are written from a one person perspective. With OUR book, you get a comprehensive guide to dealing with stress, anxiety, and the pressures of life that keep you from being happy. You’re not just getting one perspective; you’re getting more than 10! Not only will you get information about the stress and anxiety that can affect your life, you’ll also get valuable advice and tips on how to combat that stress and take back your life! And Live a More Fulfilling Life. We’re offering you the chance to finally beat stress and anxiety once and for all! Be happy, be healthy, and start by ordering this book right now! Other self help books such as ours can cost you over $50.00, but we’re offering you this one for just $14.00. And, you get all three other books free to help you be happier, love your job, and be healthier, too. As soon as you order, I'll sign a copy of BeHappy! and send it out to you right away. The other two will come to you electronically for immediate download. All 3 are FREE as a bonus. Stress and anxiety don’t have to rule your life. You can get all the answers you need inside these 4 books, starting with “Eliminating Stress and Anxiety From Your Life”. Most people who suffer from anxiety say they wish they had a book like this sooner that not only gives them the answers to the questions they have about their disorder, but also gives practical and easy tools to help them cope. I know that you will learn so much about eliminating stress and anxiety by reading this book and the other 3 free books, too. Order today and get back on the road to living a less stressful, happier, healthier life! Warmest Regards and Best of Luck! P.S. Remember, getting your copy of this amazing book is 100 percent risk-free! You have 90 days to look it over, read it, and put the advice to work for you. If you don’t think we’ve given you the valuable information we promised, you’ll receive your money back, no questions asked - and you get to keep all 4 books as our gift.